St James’ is a 15th Century Church in the Gothic Style, restored in 1848. It consists of chancel, nave, aisles, South porch and an embattled Western tower with pinnacles. This contains the 6 bells, of which two are dated 1620, a third 1629; new bells were added in the early 20th century. One, above the South aisle, is believed to be the “Green Man” a fertility symbol and nearby is the boss of the 3 Hares symbol. The bosses over the chancel are in the form of ten “Angels” holding shields each depicting the Passion, nails, scourge, cup and so on. The stained glass memorial windows were all erected in the early 1900s in memory of local families, the Mallets, the Smyth Osbourne family of nearby Ash House, the Arnolds of Nethercott and Stafford Henry Northcote, first Earl of Iddesleigh, who died in 1887. There is an unusual credence shelf built into the South wall of the chancel and one in the North wall, behind the organ. Here too, under an obtuse arch, lies the cross legged effigy of a Knight, c1250, clad in chain mail and bearing a shield. He is believed to be a 13th century squire of Iddesleigh and ancestor of the redoubtable Sir John Sully a distinguished warrior in the reigns of Edwards I and II who had a “Fair House with two Parks” in Iddesleigh and died in 1387 aged 105. The headstone of one of the sons of the Reverend Jack Russell (of terrier fame, who was curate here for a while) is behind the organ. The beautiful altar and pulpit frontals and falls were worked by Mrs Gisela Banbury. As were the kneeler designs taken from the roof bosses. Completed in 2002. The above is taken from the outline compiled by Mrs Dorothy Ellis of the Old Northcote Arms near the church. The three hares is a circular motif which appears in sacred sites from the Middle and Far East to the churches of south west England (where it is often referred to as the Tinners’ Rabbits) and many historical synagogues in Europe. 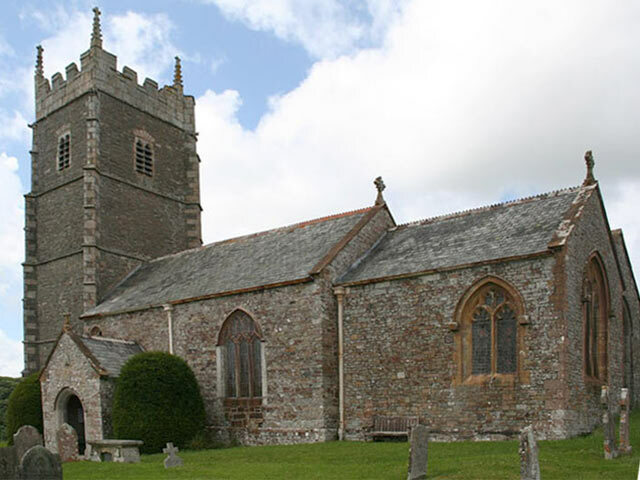 St. James’s, Iddesleigh - The three hares motifIt has been used as an architectural icon, a religious symbol, and modernly as a work of art or a logo for adornment. The symbol features three hares chasing each other in a circle. Each of the ears is shared by two animals so that only three ears are shown. It has a number of mystical associations and is often associated with fertility and the lunar cycle. However, its precise origins and significance are uncertain, as are the reasons why it appears in such diverse locations.